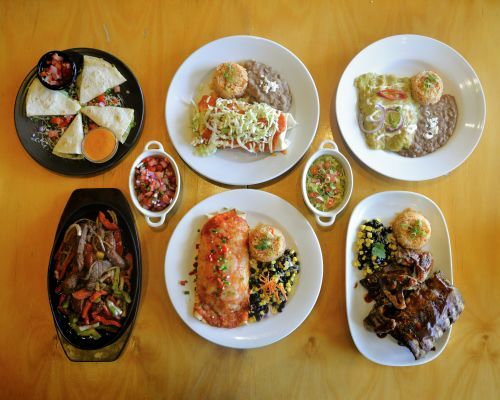 Menulog delivers for Cisco's Restaurante Mexicano so you'll be able to track your courier on a map. Filled flour tortilla smothered with red Colorado sauce, chipotle sauce or salsa verde. Topped with lettuce, tomato and sour cream served with Mexican rice and a choice of either frijoles pinto beans or black beans and corn salsa. Filled flour tortilla smothered with red Colorado sauce, chipotle sauce or salsa verde. Topped with three cheese blend and baked in the oven served with Mexican rice and a choice of either frijoles pinto beans or black beans and corn salsa. Tender and hickory smoked baby back ribs smothered in BBQ sauce served with Mexican rice and frijoles or black beans and corn salsa. Beef, beans, tomatoes, ground chilli and spice topped with cheese. Combination of cheeses melted into a flour tortilla served with red salsa, and chipotle mayonnaise. Choice of preparation: regular with cheese, spicy with jalapenos and shallots, chicken with spicy shredded chicken or beef with mildly spiced shredded beef. Hickory smoked BBQ baby back spare rib strips and chicken wings topped with BBQ sauce. Tender marinated meat lightly sauteed with strips of onion, red and green capsicum served with three warm flour tortillas, cheese, lettuce, salsa and sour cream. Two full racks of ribs and twelve full chicken wings. Combination of tomatoes, green chilli, onion, lemon, coriander and dash of spice. Layers of guacamole, tomato, cheese, shallots and sour cream topping. Combination of cheeses melted into a flour tortilla served with red salsa and chipotle mayonnaise. Choice of preparation: regular with cheese, spicy with jalapenos and shallots, chicken with spicy shredded chicken or beef with mildly spiced shredded beef. A twelve inch flour tortilla filled with Mexican rice, your choice of frijoles or black bean and corn salsa, any one of the fillings listed below and lettuce, tomatoes, cheese, sour cream and your choice of Colorado sauce, chipotle sauce or salsa verde. The bowl has frijoles, Mexican rice, a choice of the fillings below and your choice of Colorado sauce, chipotle sauce or salsa verde. Topped with lettuce, cheese, and sour cream. Green prawns, salmon fillet and Tassie scallops in creamy garlic sauce, wrapped in a flour tortilla, topped with red Colorado sauce and cheese and then baked served with Mexican rice and a choice of frijoles or black beans and corn salsa. Chilli con carne, Mexican rice, cheese and sour cream wrapped in a flour tortilla served with a Mexican salad. Bowl of chilli con carne topped with cheese and served with Mexican salad, Mexican rice and warm corn chips. Filled corn tortilla topped with your choice of Colorado sauce, chipotle sauce or salsa verde and blend of cheese and baked in the oven served with Mexican rice and your choice of frijoles or black beans and corn salsa. One flour tortilla folded over a blend of cheese and a choice of fillings. Cooked on a warm hot plate, topped with salsa, guacamole and sour cream served with Mexican rice and a choice of frijoles or black beans and corn salsa. Choice of fillings: regular with cheese, spicy with jalapenos and shallots, chicken with spicy shredded chicken or beef - mildly spiced shredded beef. Spiced meatballs simmered in a tomato and chipotle sauce served on a bed of Mexican rice with your choice of frijoles or black beans and corn salsa. Great combination meal that includes one burrito, one enchilada and a spicy meatball on Mexican rice. A duo eight inch deluxe baked burritos. Spicy shredded beef baked burrito and seafood burrito with prawns, scallops and salmon fillet served with Mexican rice and a choice of frijoles or black beans and corn salsa. Four smothered or baked burritos. Two burritos and four enchiladas. Large served of Mexican rice and frijoles or black beans for four.